This, to me, is the epitome of the perfect summer dessert. Honestly, I feel a little bad that I’m only giving you this recipe now, when summer is waning. But, fear not, you still have time! August is like one really long, slow death. The sunset of summer. It’s bittersweet but also welcome. And it brings really tasty fruit. I always get really excited at the beginning of the summer because of berries, and for some reason have always overlooked late-summer fruits. 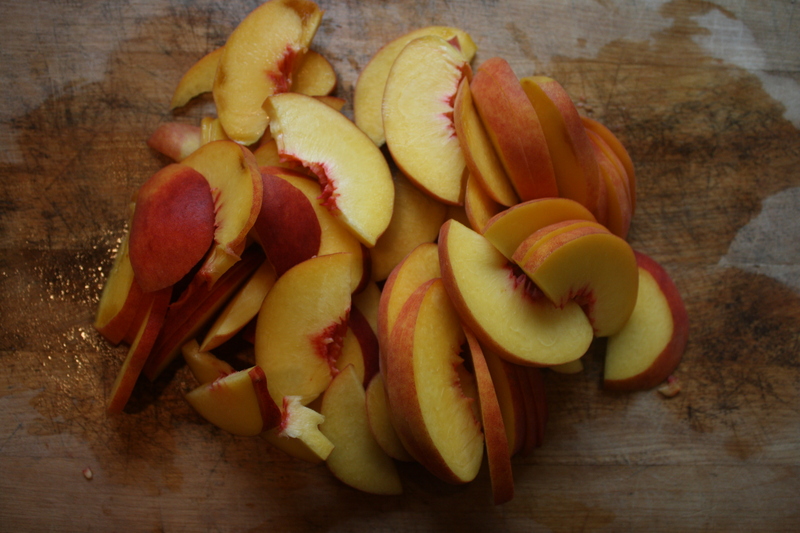 Extra ripe, bursting peaches and plums seem to get lost in the shuffle, at least for me. But not anymore! 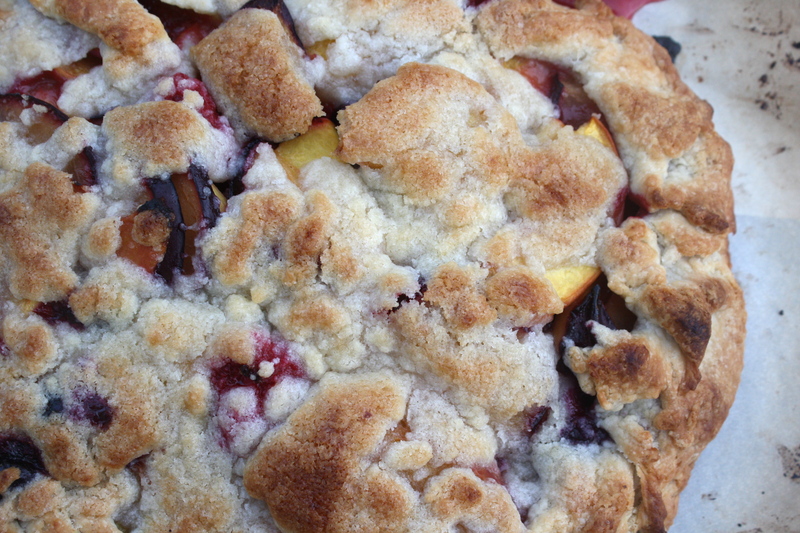 This crostata really highlights the fruit August has to offer. You don’t do much too it, just mix them up in a bowl, wrap them in buttery crust, and sprinkle a crumb on top. So much easier than making a pie, and just as delicious, I would take a crostata any day. And while it won’t win any conventional beauty contests, I think it has it’s own charm. Its crust is sweeter than most pie crusts, which compliments the slight tartness of the filling. Its filling bubbles and oozes pink, syrupy juice. Its topping melts and becomes light and crisp, making the dessert just a bit richer without being too much. It’s easy and rustic (that’s code for ‘completely imperfect but I don’t care’) and is best served in large wedges with a giant scoop of melty vanilla ice cream. This recipe is more of a blueprint than anything else. Don’t like peaches? Don’t use them (also, you’re crazy). Want to use all blueberries instead of both raspberries and blueberries? Do it! Go to the famers market, see which fruits are bursting and oozing with juice with that late-August sweetness and then wrap them up in dough and bake them. There is literally nothing that could make this taste bad. Er, within reason, of course. 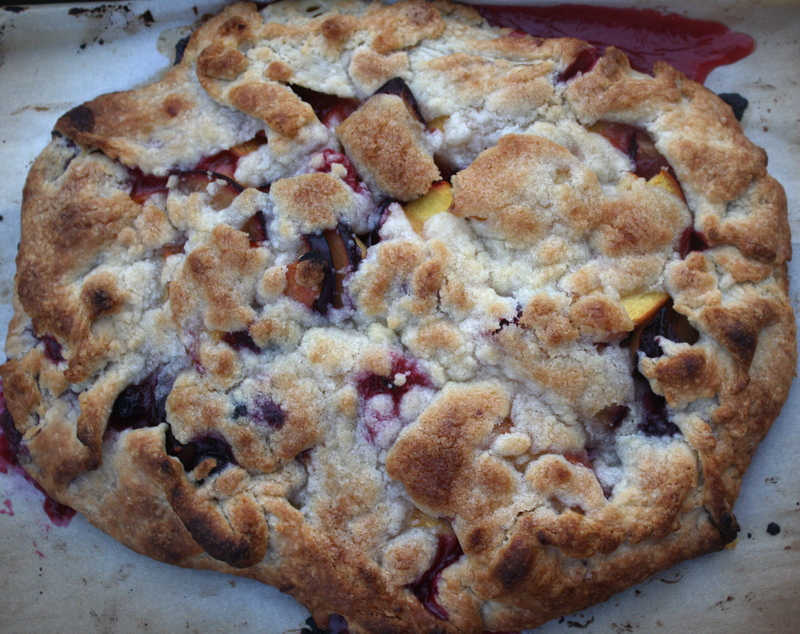 Easy, rustic, and only slightly sweet, this crostata wraps August up in a pie crust. Add the butter and, using a pastry blender, a fork, or two knives, cut the butter into the flour mixture until the butter is the size of peas. Add 4 tablespoons of ice water to the butter mixture and quickly incorporate. If it does not hold, add more ice water, tablespoon by tablespoon, until the dough forms into a craggily mass (it usually takes 6 tablespoons). Cup up the peaches and plums into thin wedges. Place in a large mixing bowl with the blueberries and raspberries. Toss fruit with the flour, sugar, lemon zest, and lemon juice. Add the butter and cut it into the flour mixture using a pastry blender, fork, or two knives until crumbly. Using your fingers, rub the butter mixture until it is homogenous. Place the fruit mixture in the middle of the circle, careful to leave a 1 inch border. Carefully fold the border over the fruit, pleating every few inches. 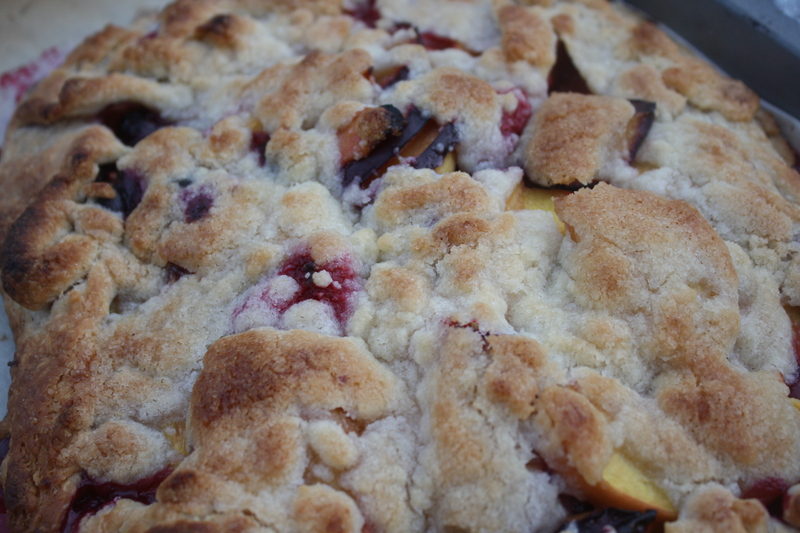 Bake for 20-25 minutes, until the crust and topping are golden brown and the fruit is oozing and bubbling. Let cool slightly. Serve warm, in large wedges with a healthy scoop of vanilla ice cream.